We Love Eating Salad Everyday – and We Think You Can, Too! 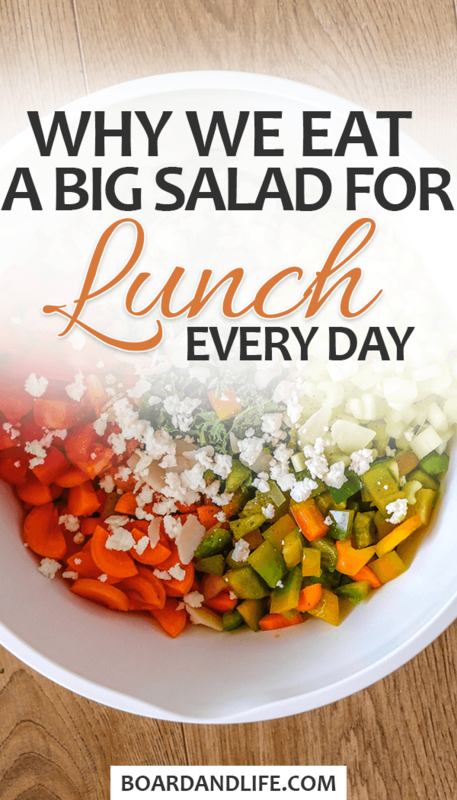 Let’s get this out of the way right off the start: we eat a big salad for lunch basically everyday, and we’ve been doing it for approximately a month now. To be honest, we didn’t set out to start eating salad everyday for basically a month – it just kinda happened. We are pretty conscious of what we put in our bodies. We aren’t vegan or vegetarian – but we do try to limit our meat consumption as well as our consumption of processed/sugary foods. We are also very busy during the day so we wanted a stress-free lunch option that we didn’t have to think about. Striving to find a food that met all these things led us down a path of salad making and deliciousness that we never imagined. Turns out, eating a salad for lunch everyday has a ton of benefits. We didn’t do it to lose weight or diet. We simply started for convenience and deliciousness, and we’ve had some interesting results and realizations. So, we wanted to share the benefits we can think of having made lots of big salads over the past few weeks. We also wanted to share our recipe with you so you can give it a go or customize it to be your own salad! There’s a myth going around that salads have to be boring and not flavorful. We think this is not only untrue but also misleading. We’ve been told that healthy foods like vegetable aren’t tasty compared to the usual foods that get consumed. Most of the food consumed these days is full of sugar, salt, or fats – so OF COURSE it’s “tastier”. Humans are programmed (by evolution) to seek these properties in foods for survival. But you aren’t a caveman/cavewoman, and you can get the nutrients you need when you need them. This means that we have decisions to make over which food we consume – and usually, we choose poorly. This is actually one of the reasons people do not eat healthier: our learned behaviors and choices. So, that said, our salads are super tasty because we make them tasty for us. The things that we add to them are things that we like. However, we still make sure that we don’t sacrifice nutritional value for taste. What we add might be different from what flavors you like so you’ll have to experiment with which salad recipe works best for you. Half the fun is experimenting! Going back to what we discussed above, our salads are tasty because we customize them to how we like them. We also never make the same salad exactly the same way twice! Sometimes we do a little bit of bacon and avocado, sometimes it’s just green vegetables, olive oil, and a few spices (garlic powder). Like we also said above, you do have to consider what you are adding and how much. If you make a salad but cover it in unhealthy add-ons, you start to reduce the nutritional value for your body. 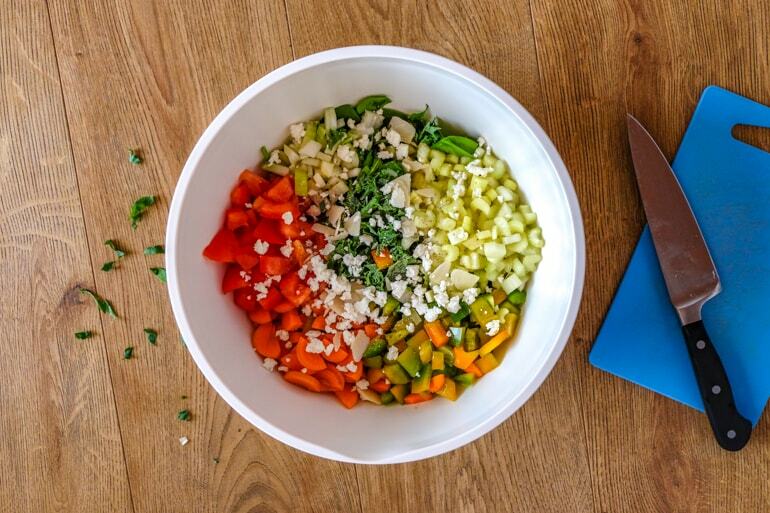 It’s all a balancing act – that’s why we ensure that the base of our salad is ALWAYS a heap of colorful vegetables. We’ve written our exact recipe down below to give you some inspiration for your own salad. Everyone prefers different tastes so check it out and let us know if you make a big salad! We could spend a whole paragraph trying to tell you how fast it can be to create a big salad, but by the time you are done reading, we could have already made one. Honestly. 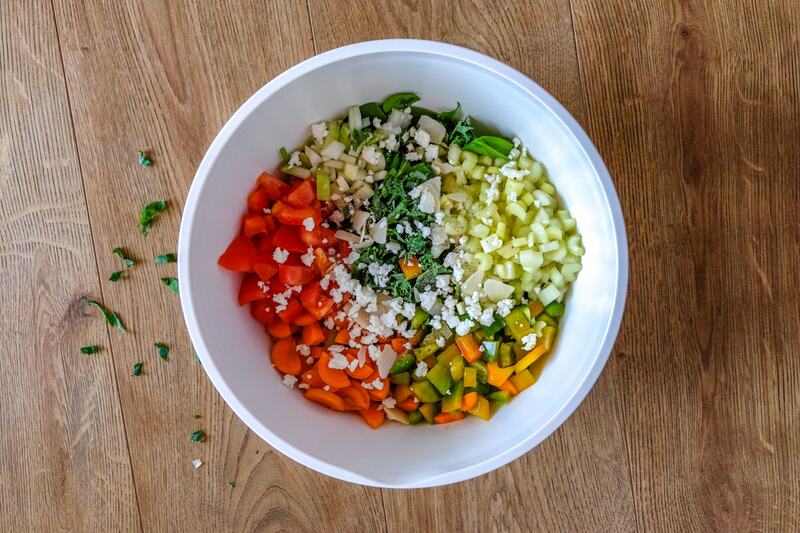 We grab our big plastic mixing bowl, wash the veggies, start chopping everything (doesn’t have to be perfect), add spices and oil, mix it around, serve. Done. Obviously, if you decide to cook some bacon, some chicken, fry up some tofu, or chickpeas, the process will take a bit longer but you get the idea. We are two people so while one person cooks the other is chopping veggies. It’s a good system. Eating a big salad for lunch also takes away a TON of the stress over meal prep. There is no guesswork involved. We know we are going to have a big salad – and it’s up to us to customize it for that day. There is no deciding between a sandwich or pizza or this or that. It’s salad. Period. Mentally, we feel this is good for us too since there’s no extra stress added to the day. This one is VERY dependent on what you put in it, but having a big salad for lunch is a good way to get your daily intake of vegetables (or at least try to get close). When you start cutting up raw, whole vegetables, they add up quickly to the point where you’ve packed in a few vegetable servings without realizing it. Of course, we do add on a few things that aren’t as healthy – but we believe in “everything in moderation”. So a little salt, oil, or animal-based protein is okay for our bodies so long as the base (and majority) of the salad is fresh, uncooked, vegetables. There is another big myth going around that it’s expensive to eat healthily and maintain a healthy diet. This is partially untrue. While it’s true that fresh produce can be more expensive than processed meals and other processed food items, buying vegetables in bulk (and eating everything you buy) is a key to saving money. Part of the money we throw away is the food we waste because it goes bad. If you don’t use what’s in the fridge, it spoils and that is literally throwing money away. BUT with a big salad, if you buy many carrots, many cucumbers, and a head of lettuce or bag of spinach, that’s good enough for 3 maybe 4 days worth of big salads. All of a sudden, you’ve got food for lunches for days on end, it is healthy, and you didn’t waste fresh produce and have to buy more. When you run out, you buy more… with the money you saved by NOT throwing food away. You can save a lot of money by meal prepping and planning ahead. Salads are great for that. We should also mention that we are definitely “budgeters” and do NOT have an unlimited level of income to spend on buying healthy food. So, if we can do this with a limited income, we feel it’s possible for others, too. This is a photo of our ACTUAL salad! This is a simple tasty salad with ingredients you can find readily available and usually in season at any grocery store or market. Of course, if you want you can add your own pre-mixed, store-bought salad dressing to get you into eating salads. Just try to reduce it over time and remember that most store-bought dressings are full of sugar – that’s why they are tasty! These are the standard ingredients that we usually always have on hand. We don’t always include all of them but for the most part, our salads have what is listed below! You can always substitute items for taste or allergies. Obviously, we don’t add ALL of these at once. We add these in flavor combinations. For example, the bacon and avocado are a pair for us, the feta and olives are a pair, the chicken and sunflower seeds are a pair, and so on! Seeds: Pumpkin, unsalted sunflower, etc. We usually keep our dressings VERY simple – just one type of oil and a few dry spices. You can always break up the oil with an acid like vinegar or lemon/lime juice. And there you have it – some of the reasons we eat a salad for lunch every day. Honestly, we love it – but we know it might not be for everyone. Eating well can be difficult and changing food behaviors can be even tougher when they are ingrained after years of eating. Our challenge to you is to create a salad you think you might like and go from there. Just don’t give up, be brave, experiment, and you will find a salad that works for you and your tastes! Let us know how you make out if you do try it out. We’d love to hear about your salad journey!